Don't miss the latest book from the author of Eragon, The Fork, the Witch, and the Worm: Tales from Alagaësia, coming December 31, 2018! 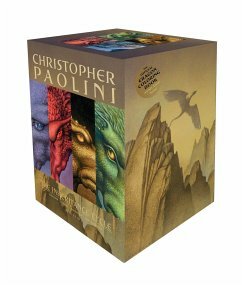 The boxed set collection of the worldwide fantasy phenomenon has a brand-new look that showcases new interlocking art across the spines of the books! The Inheritance cycle is the unforgettable, worldwide bestselling saga of one boy, one dragon, and a world of adventure. When Eragon finds a polished blue stone in the forest, he thinks it is the lucky discovery of a poor farm boy. But when the stone brings a dragon hatchling, Eragon soon realizes he has stumbled upon a legacy nearly as old as the Empire itself. Overnight his simple life is shattered, and he and his dragon, Saphira, are thrust into a perilous new world of destiny, magic, and power. Can Eragon take up the mantle of the legendary Dragon Riders? The fate of the Empire may rest in his hands. . . .